With modern technological advancements, there is a great variety of lenses available. There are different lenses for treating almost every common eye condition and to suit different lifestyles. Bifocals allow you to use different parts of the lens depending on what you want to focus on. They mean you can have one pair of glasses with which you can focus on both distant and close up things. Part of the lens is used when looking in the distance and the other part of the lens is used when doing things close up such as reading. Bifocals can be made up to suit exactly your requirements but generally the lower part of the lens is used for close up vision so you look down to read. The top part of the lens is generally used for seeing in the distance so you look up to see objects far away. For people who would normally need bifocals, progressive lenses provide the ability to see both near and distant objects with one lens. They do not have the line across the lens which is characteristic of bifocals. They allow the person to With progressive lenses you get the best vision when looking directly at the object you want to focus on. Your optician will measure both eyes in relation to your glass frames to ensure you get the clearest vision in the correct place for you. With new developments in lens manufacturing, those people with very high prescriptions no longer have to wear thick and heavy lenses. Previously people who were very long sighted needed glasses with thick lenses but these lenses magnified the eye, making it look bigger than it actually was. 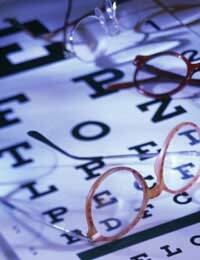 People who were very short sighted needed thick lenses which made the eye appear much smaller. As these lenses changed the appearance of people’s eyes they were not very popular. High index lenses have been developed which are much thinner and can be fitted into small glass frames to keep them as lightweight as possible. Photochromic lenses are very useful in conditions where the light is changing. As the light changes the lenses become darker and provide protection from sunlight and ultraviolet (UV) rays. They provide a good practical solution for people who wear glasses and who also need sunglasses. The lenses can adjust to different light levels very quickly so are very convenient and they ensure your eyes are protected from the damaging effects of the sun. The lenses will be made up to your usual prescription and are available in glass or plastic. The first types of photochromic lenses were made in glass and they were fast at adjusting to light levels but plastic lenses are just as effective these days and are much lighter. Glass photochromic lenses can be heavier than plastic and are easy to damage. Some people prefer plastic lenses because they are lighter and are scratch-resistant. Your optician will be able to advise you as to the benefits of different types of lenses.